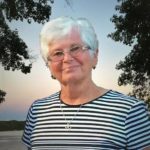 Barbara L. Wade, age 75 of Waterman, IL passed away at her home on March 28, 2019 surrounded by her loving family. She was born August 10, 1943 in Aurora, IL to Mahlon and Blanche (Campbell) Sawyer. Barbara attended Greentown Schoolhouse and later Waterman Elementary, Junior High, and High School graduating with the class of ’61. She continued her education at Sterling Beauty School and went on to teach. She met the love of her life, William J. Wade in October ’61 and they were united in marriage on September 23, 1962 at Suydam Methodist Church and spent the next 56 years happily married. She was a long time member of the Waterman United Methodist Church. She enjoyed traveling, sewing, cooking, and especially loved the time she spent with her family. Her favorite travels were their 6 week trip to Alaska, their 50th Anniversary trip to Hawaii, and their numerous trips to their lake house in Wisconsin. She is survived by her husband Bill Wade of Waterman, IL and their children Brian (Debra) Wade and Brad Wade both of Waterman, IL and their daughter Brenda (Jeffrey) Norton of Sycamore, IL; her seven grandchildren Brandon Wade, Cameron Wade, Corey Wade, Tyler Norton, Reece Norton, Isabella Wade, and Cade Norton; and their great-grandson Mahlon Wade; and her brother Paul (Janis) Sawyer of Waterman, IL as well as her nephews Steve Sawyer and Kevin (Krissy) Sawyer also of Waterman, IL. Nash-Nelson Funeral Home, 1001 E Garfield St, Waterman, IL. Funeral Service will be held at 10:00 am on Saturday, April 6, 2019 at the Nash-Nelson Funeral Home. Interment will follow at Victor Cemetery in Leland, IL. Memorials will be distributed by the family in Barbara’s memory to American Cancer Society and other charities. Funeral Service will be held at 10:00 am on Saturday, April 6, 2019 at the Nash-Nelson Funeral Home. Interment will follow at Victor Cemetery in Leland, IL. Interment will follow at Victor Cemetery in Leland, IL. Very sorry to hear of Barbara's (Bobbie) passing. My wife and I offer our sincere condolences to Bill and his family. I have fond memories of Bobbie and Bill when they lived for a time in a small cottage next to my Dad's farm.